Protostelid slime molds are relatively unknown and easily overlooked. They were first recognized in the early 1960s and have been little studied since. There are 36 currently accepted species, and possibly twice that number of undescribed species. Most are microscopic. Only a few are visible to the naked eye. Honeycomb coral slime mold (Ceratiomyxa fruticulosa) is the most commonly encountered protostelid slime mold and may be the most common slime mold of any kind in the world. It occurs on every continent except Greenland and Antarctica. It is found in forests on rotting fallen logs and branches. It can form extensive colonies one meter or more long. It is very short lived, appearing after a soaking rain and disintegrating in just a few days. Honeycomb coral slime mold first appears as a thin, watery, translucent, mucus-like layer, creeping across the wood, engulfing bacteria, protozoa, and particles of nonliving organic matter. Eventually it fruits, forming clusters of erect, translucent columns. The columns have a frosted or powdery appearance due to a dense covering of tiny, white, spores on long, thread-like stalks. 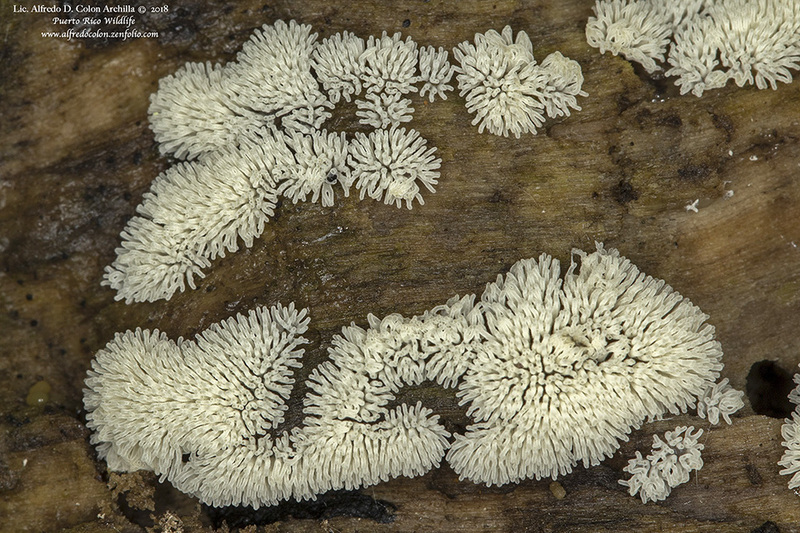 This entry was posted in Uncategorized and tagged Ceratiomyxa fruticulosa, honeycomb coral slime mold on January 30, 2019 by John Valo.